The North Carolina Department of Natural & Cultural Resources supported the following events. Friday, Feb. 22 to Saturday, Feb. 23, Black Mountain College Museum & Arts Center, Asheville, N.C.
A timely restaging of We Insist! Max Roach’s Freedom Now Suite, a seminal recording from the civil rights era. The piece will be performed by the NYC / Philadelphia-based ensemble Fresh Cut Orchestra with vocalist Melanie Charles. Recorded in the fall of 1960, the Freedom Now Suite was the most openly political jazz recording ever made, combining musical prowess with political dialogue. Nearly 60 years later, the issues posed by We Insist! are still relevant to our current political moment. Thurs., Feb. 28 to Saturday, March 2, Andy Griffith Playhouse and Historic Earle Theatre, Mount Airy, N.C. Hosted by the Surry Arts Council with support from the N.C. Department of Natural & Cultural Resources, the event is held in conjunction with the Tommy Jarrell Festival. Classes and workshops in fiddle, banjo, guitar, bass, mandolin, flat foot dance/square dance calling, and harmony singing are taught by some of the most esteemed and respected women in the field. Friday, April 5 to Sunday, April 7, Various Venues, Asheville, N.C. Connection. A word that by definition means to join together to establish a link, so as to provide access and communication. Connect Beyond Festival has established that link and is using music, film, and storytelling to create connections. More than just an event, Connect Beyond Festival is a movement to develop a network of people inspired by creative mediums and united in the pursuit of equality and social justice. Their goal is to inspire a sense of community and personal engagement. 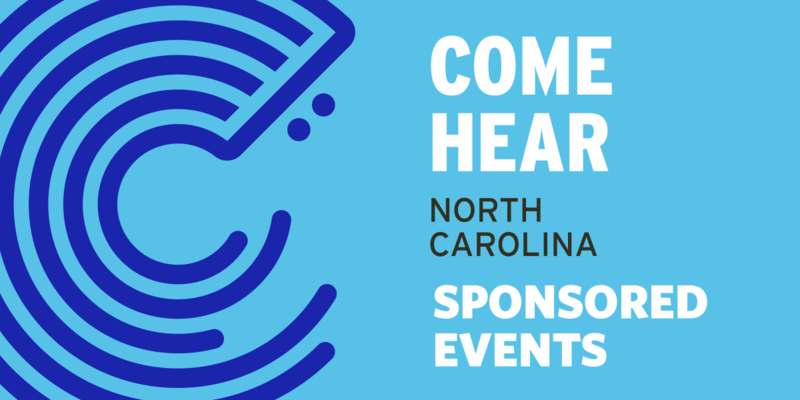 Come Hear NC is supporting Connect Beyond’s North Carolina Music Showcase on Sat. April 6 at the Orange Peel. The evening will feature a blend of artists from North Carolina playing originals and artists from around the country paying tribute to North Carolina musicians. Lauded as “Asheville’s version of SXSW” (Ashvegas) this event is perfect for those who are looking for a more dynamic festival experience - one that prioritizes exploration and participation just as much as entertainment. If you’re looking to broaden your horizons, to engage with others, and want to leave a festival with more than just a hangover, Connect Beyond Festival is just the place to be. Thursday, April 11, WinMock at Kinderton, Bermuda Run, N.C. The Blue Ridge Music Center presents "Mill Towns and the Birth of American Music," a one-day conference exploring the role of textile mills and factories in traditions that are the roots of today’s American music. The day will include a Keynote address by Wiley Cash, author of The Last Ballad, with special guest Patrick Huber, author of Linthead Stomp, as well as musical presentations, panel discussions, and breakout sessions with Sarah Bryan, Kinney Rorrer, Bob Carlin, Lightnin’ Wells, Ralph Berrier, Jr., Laurelyn Dossett, Hunter Holmes, and more. Friday, April 12 to Sunday, April 14, Ashe Civic Center, West Jefferson, N.C. The North Carolina Department of Natural & Cultural Resources is supporting the celebration of the work of Ola Belle Reed with the Song Writer’s Retreat presented by the Ashe County Arts Council. The weekend retreat welcomes songwriters and music makers. Scheduled at the Ashe Civic Center Friday, April 12 through Sunday, April 14, 2019 the retreat is open to songwriters of all genres and styles, and all accompaniment instruments are welcomed. The instructors include Cathy Fink, Alice Gerrard, Sam Gleaves, Claire Lynch and Marcy Marxer. Workshop space is limited so register early. Cost is $250 adults and $150 students. Tuition assistance and limited partial scholarships available. Thurs., April 25 to Sunday, April 28, Wilkes Community College, Wilkesboro, N.C. Hosted by the Surry Arts Council with support from the N.C. Department of Natural & Cultural Resources award-winning old-time and bluegrass musicians from the area who participate in the Blue Ridge Music Trails will lead the workshops at the Old Time Fiddlers’ Convention. The Ocean City Community, founded in 1949, was the only place African Americans could purchase coastal property in North Carolina, 15 years before the Civil Rights Act was passed. In 2009 the Ocean City Beach Council conceived the idea of a summertime family celebration to commemorate the 60th anniversary of the Ocean City community. This year marks the 10th anniversary of this festival promoting and preserving the history and expanding the knowledge of Ocean City by celebrating jazz legends and up-and-coming greats. Friday, Sept. 6 to Sunday, Sept. 8, Various Venues, Raleigh, N.C.
2019 is Hopscotch’s 10-year anniversary. Wide Open Bluegrass: A one-of-a-kind urban bluegrass festival! Wide Open Bluegrass will once again feature a North Carolina musicians stage, sponsored by the Department of Natural & Cultural Resources. The free street festival features IBMA and Grammy Award winners, top-notch emerging acts, traditional bluegrass, and acts that stretch the boundaries across eight stages in downtown Raleigh.